In recent years there has been a lot of discussion concerning the use of stem cells in both animals and humans. The initial work with stem cell therapy has been done in horses for the treatment of ligamentous and skeletal muscle injuries resulting in lameness. In the last five years this technology has carried over into the companion animal field primarily in dogs. At the animal hospital I work at we’ve been doing stem therapy for osteoarthritis for 3 years in 20 dogs. I’ve also had opportunity to treat a Shar-Pei in early kidney failure with systemic stem cell therapy which I will discuss later. When we talk about regenerative stem cell therapy in companion animals we are referring to mesenchymal stem cells or adult stem cells These are multipotent adult progenitor cells which retain the ability to differentiate into other tissues such as bone, cartilage, muscle, marrow, tendons and ligaments. These cells normally function in the body to repair tissues that have been damaged or to replace cells that have reached the end of their life span and need to be replaced – in other words they are part of the normal physiology of the animal. These are not to be confused with embryonic stem cells which are harvested from the embryo. Embryonic stem cells function to form an entire animal, not to do reparative work. They are very primitive cells that can form teratomas (a type of tumor composed of many cell types) and can be rejected by the body they are implanted in due to their foreign genotype. Embryonic stem cells have the advantage of differentiating into many different cell types, but can also display uncontrolled growth similar to that seen in many cancers. Adult, adipose (fat) derived; autologous (self) stem cells are the ideal source for regenerative stem cell therapy. Adult stem cells are better suited for clinical work and eliminate the ethical and moral controversy which surrounds embryonic stem cell work. Why are stem cells useful? They can be effectively isolated (harvested) from the patient and expanded – we can increase their numbers after they are harvested. They can be cryopreserved and still maintain their viability and be induced to differentiate into a variety of different cell types. Stem cells are considered immune-privileged due to their lack of expression of certain surface antigens which is necessary for lymphocyte recognition (both B-cells and T-cells). They also have the capability to suppress lymphocytes. These characteristics tend to reduce graft-vs.-host rejection phenomena and also suggest a potential use of allologous stem cells (same species, different individual) in stem cell therapy. They also have the property of “homing”, meaning they can migrate to sites of injury when given systemically. This property of stem cells is due to the multiple growth factors, cytokine and CD44 receptors present on stem cells. They also follow chemotactic distress signals produced by injured tissue. They have an inherent ability to attach to injured endothelium (lining of the blood vessels). They not only provide a therapeutic effect by differentiating into a specific cell lineage such as an osteoblast (a bone forming cell) but also by their paracrine effects – substances secreted by stem cells act on surrounding cells to modulate their behavior. These substances include interleukins 6, 7, 8, 11, 12, 14, and 15; fibroblast growth factor (FGF); vascular endothelial growth factor (VEGR); and platelet-derived growth factor (PDGF). Mesenchymal stem cells are known to exert anti-proliferative, immuno-modulatory, and anti-inflammatory effects via chemokines and cytokines. Stem cells also enhance proliferation, migration, and differentiation of endogenous stem cells in most tissues of the body. How do we harvest stem cells? Common places to harvest fat in the adult dog are just behind the shoulder and in the inquinal area (crotch) where the rear legs attach to the trunk. I usually use the falciform fat in the cranial abdomen because there is usually a large amount of fat here and there is no risk of seroma (serum pocket) formation. The harvesting does involve a general anesthetic procedure and must be done in a sterile manner. Two companies are active in stem cell therapy. Vet-Stem¨ was formed in 2002 and is located in Poway, CA. They have a web site at www.vet-stem.com. 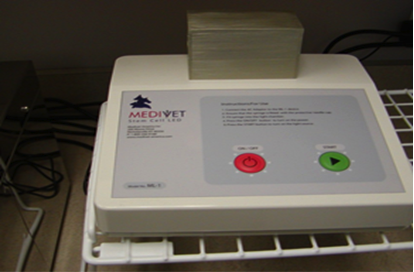 The second company is Medivet Lab Services, Nicholasville, KY and their web site is www.MediVetLabs.com. 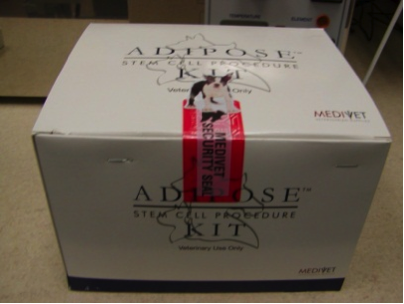 At West Suburban Veterinary Associates, we are now using the MediVet Lab system as it allows us to harvest the fat, process the stem cells and implant the stem all within the same day. 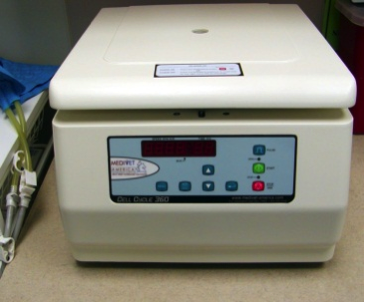 The first step involves separating the stem cells from the adipose (fat) tissue using an enzyme wash and centrifugation to isolate the stromal vascular fraction (SVF). The SVF contains many progenitor cells for different cell lines and many beneficial proteins. A blood sample is taken from the patient, undergoes gradient density centrifugation to separate its components and platelet-rich plasma (PRP) is isolated from the blood sample. PRP is a dense concentration of platelets derived from blood plasma which contains many growth factors and has been shown to enhance the proliferation of human adipose-derived stem cells. Intra-articular (joint injection) of PRP by itself has been shown to provide pain relief for 6-8 weeks. Finally the stem cells in the SVF are activated by the addition of the PRP and exposure to low-level light (photoactivation) of specific wavelengths. This is accomplished by exposing the stem cells to a light emitting diode (LED) for 20 minutes. This process induces release of anti-inflammatory cytokines and inhibit pro-inflammatory from white blood cells present in whole blood samples. This entire stem cell harvesting process takes about three hours. Finally the activated stem cells are ready to be injected into joints, and/or intravenously. Remaining stem cells can be banked at the MediVet laboratory facilities in liquid nitrogen to be re-activated at a later time as needed. The cost of the procedure is about $2500 depending on how many joints are treated. 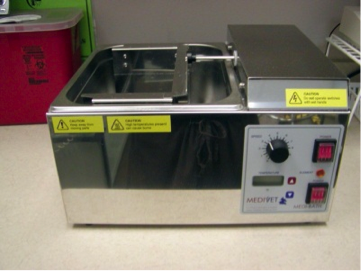 The Medivet system does involved purchase of the stem cell processing kits and purchase of the necessary equipment – water bath, centrifuge, laser light, etc. Veterinarians and technicians must go through a credentialing course and several continuing education seminars to become certified to do stem cell procedures. What are the indications for stem cell therapy? The major application at this time is the treatment of osteoarthritis in degenerative joint disease. With intra-articular injections of 3-5 million stem cells per joint, most dogs show improvement within 10-14 days. With maximum improvement by 90 days post-injection and some dogs show sustained improvement for over 1 year. Banked stem cells can be revived and joints injected for “touch-ups”. Regenerative stem cell therapy uses also include ligament and tendon repair, nonunion fractures and muscle injuries. Other experimental uses of stem cell therapy are focused on organ disease such as those involving the liver, kidneys, heart and the nervous system. Currently, the stem cells are injected intravenously to reach these areas. Research is underway to determine stem cell dose, stem cell delivery systems and routes and how to monitor the response to stem cell therapy. As I stated at the beginning of this article I did have the opportunity to administer stem cells systemically to a 5 year-old Shar-Pei in early kidney failure. She did better for the next year with continued medical therapy for chronic kidney disease with her BUN and creatinine maintaining at high normal levels. I had not done kidney biopsies although I had previously done intestinal biopsies to diagnose inflammatory bowel disease in this dog. Relative contra-indications to the use of stem include cases of sepsis (severe systemic infection) and neoplasia or cancer. It is also a good idea to stop any antibiotic, steroid or NSAID use for several weeks prior to using stem cell therapy. Recall that NSAIDs include aspirin, Rimadyl¨, Deramaxx¨, Meloxicam¨, etc. It is also of note that stem cells have hyaluronan receptors on their cell membranes -possible significance for Shar-Pei? It is becoming more common place for veterinarians to work with stem cells, but it is not the standard of practice at this time. Most doctors have heard of stem cell therapy and can probably refer patients to someone in their practice area who do the procedure. The web sites of MediVet and Vet-Stem can give information on veterinarians in your area that do work with stem cells. I would also advise that stem cell therapy be considered early in the course of degenerative joint disease and not as a last resort modality. It is an exciting relatively new technology whose applications are just beginning to be realized in animals. It is also being applied in the human medical field more frequently primarily in orthopedic surgery, neurology, cardiology, and plastic surgery.